i Click 'view all' to instantly compare this fantastic deal with offers on other top gaming headsets. 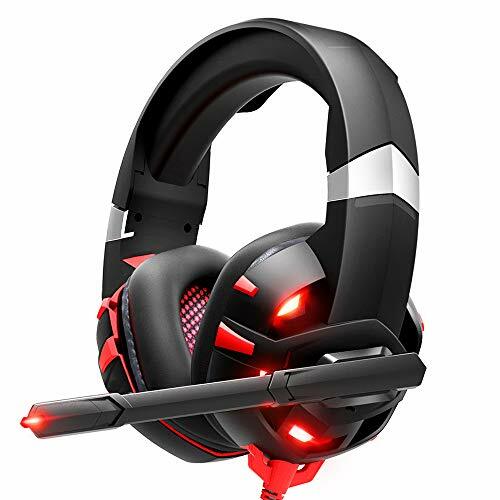 RUNMUS Gaming Headset Xbox One Headset w/ 7.1 Surround Sound is currently selling at $28.45, approximately $1.84 lower than average, giving a potential saving of $74.55 right now. With a lowest price of $28.45 and an average of $30.29 it is selling on the low end of its usual range. Price volatility is 2.23% (meaning it does not change often), so the price should stay low for a while. Right now this product is a recommended 'fantastic deal'. The current deal is also the best price on this item over the last month. 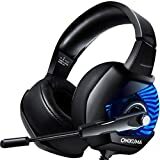 Compare the current price, savings (in dollars & percent) and Buy Ratings for the top Gaming Headsets that are closely related to RUNMUS Gaming Headset Xbox One Headset w/ 7.1 Surround Sound. Here is how RUNMUS Gaming Headset Xbox One Headset w/ 7.1 Surround Sound compares with other leading Gaming Headsets. RUNMUS gaming headset, the professional gaming headset for game enthusiasts. IMMERSIVE SOUND QUALITY RUNMUS gaming headset equipped with a premium 50mm neodymium driver that offers immersive sound quality. It hugely augment immersive aural experience, making you feel like in the real battle field. COMFORTABLE WEARING Using soft protein ear pads and retractable headband, this xbox one headset gives customers most comfortable wearing experience. and the weight is only 1 LB. You won't feel any discomfort even after a long gaming sessions. MULTIPLE PLATFORM COMPATIBILITY This ps4 headset with a 3.5mm audio jack is compatible with PC, PS4 controller, Xbox One controller(Please note: newer models have a headphone jack, older ones require an adapter. ), Nintendo Switch (audio), Nintendo New 3DS LL/3DS (audio), Nintendo 3DS LL/3DS (audio). NOISE CANCELING MICROPHONE With the noise canceling microphone, this gaming headset provides high clarity sound communication for players and filter most ambient noise at the same time. Every voice command would not be missed with this sensitive microphone. FASCINATING LED LIGHT When you plug in the USB jack, the fascinating LED light will be on. Red LED light on both sides of RUNMUS gaming headset make it looks cooler and boost the gaming experience. SPECIFICATIONS Headphones Driver: 50mm Frequency Range: 20Hz-20KHz Impedance: 32Ohm +/- 15% Sensitivity: 105 +/- 3dB Input Power: 20mW Cable Length: 7.22Ft / 2.2m Approx. Weight: 12Oz LED working voltage: DC5V +/- 5% Microphone Microphone sensitivity: -38 +/- 3dB Pick-up Pattern: omnidirectional Headset Jack: USB +/- 3.5mm 4Pin Features50MM DRIVER DELIVERS SURROUND SOUND. Whether you're immersed in God of War or want to hear your enemies motion in Fortnite, PUBG or CS:GO, wearing a professional gaming headset does matters. With a 50mm driver, RUNMUS PS4 headset offers an incredibly surround sound for both games and music.ERGONOMIC DESIGN & PREMIUM MATERIAL. Gamers usually play games for many hours, so the comfort is also a key factor when choosing a Xbox one headset. We have tested our headsets for many years on hundreds of different heads, the retractable band and breathable ear pad make sure every player could enjoy the optimal wearing comfort.MULTIPLE PLATFORM COMPATIBILITY. 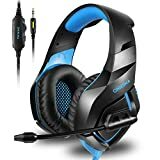 This gaming headset with a 3.5mm audio jack is compatible with PC, PS4 controller, Xbox One controller(Please note: newer models have a headphone jack, older ones require an adapter. ), Nintendo Switch (audio), Nintendo New 3DS LL/3DS (audio), Nintendo 3DS LL/3DS (audio).NOISE CANCELING MICROPHONE. This PS4 headset provides high-end noise cancellation to enable you to chat to your fellow players with crystal clarity. If you wanna enjoy your valuable me-time without communicating with other players, you could turn off the mic by flipping the switch.